One day while figuring out what it meant when someone Pinged a blog post I had written, I came across a discussion about R.E.A.L. Science Odyssey Biology 2. One of the posters was sharing material they had used to supplement their science co-op class that was using Biology 2. I was seriously impressed with the list and the education in science the students in her co-op class are getting. I asked if she would share it with me to put it on my blog as a guest post. All of us got lucky when Karen said yes! After seeing this list, now I know why all those homeschooled kids are winning science fairs, they are learning it from parents like Karen and Ruth. There is actually only one problem with this post. We are all going to want to move to Karen’s neighborhood so our kids can be in her science co-op! Karen homeschools 4 kids ages 16, 13, 13 and 11 and she has been homeschooling for more than 10 years. She lives in a small town in Ontario, Canada where we keep chickens and bees. Ruth has 1 son who is 13. She has a background as a certified teacher and tutor and has a degree in Kinesiology. One of the highlights of our year has been our science co-op. A good friend and I taught biology to 5 kids ranging in age from 10 to 13. We used Pandia Press Biology 2 as our curriculum and over the year we’ve learned a lot, not only about biology, but about how to teach and engage a diverse group of kids and help them dig into the material. When we first started the program we stuck fairly close to the curriculum as it was written but as we gained more insight into how the kids learned and functioned together as a group we felt more comfortable adding in additional resources. For topics that were more dense we realized that we needed to slow down and add in more activities that appealed to everyone’s learning styles in order to help the kids really understand the material. We wanted to focus our co-op time on doing hands-on learning together. In advance of our meeting each family would read the text individually and add in additional readings or videos to suit their learners and their schedules. We would also do the quizzes and The Famous Science Series components on our own and get together to do the labs, play games, and do activities as a group. Following Blair’s approach in the curriculum, we tried to appeal to diverse learning styles and did our best to include lots of hands on activities, model making, skits where we acted out processes, songs or short videos, labs, games and puzzles, and some elements of review. We accessed a wide variety of materials from the internet in order to do this. Our goal was to provide as rich a study as we could, keeping time and expenses in mind. For the most part we did the labs in Biology 2 as written and added on to that. In some cases we substituted labs that we found that worked better with our particular group of kids. Blair has asked me to share what additional online resources we used in developing the hands on activities and I have outlined them below by chapter or topic where there is significant overlap. In addition to these links, we had some materials at home that we used to supplement (board games, models, etc) but I have left most of these off the list for brevity. I have also left off most of the books and videos we used, with the exception of those that provide instructions or ideas for more hands-on learning. The Teacher’s Manual of Biology 2 has a long list of additional books, videos, and online games for each chapter. We used these as review cards for parts of a plant and animal cell and we returned to these each week for a few weeks to help the kids cement their learning. We supplemented with experiments from lab kit on chemistry of food from Home Training Tools and played a homemade jeopardy game to review vocabulary and content. We made playdough models of osmosis and active transport and did a milk, soap and dye demonstration of hydrophilic and hydrophobic processes. For this week we did a few extra experiments at home related to respiration and transpiration and played a photosynthesis game. We felt that we needed to supplement and review here. This coloring book has more in depth material than we needed so we selected pages that we wanted to review. https://www.youtube.com/watch?v=BJaVrHBrCns – this was excellent for understanding the concepts. We watched it before teaching and again with the kids. Mitosis and Meiosis were also concepts that needed some extra time and activities so we took 3 co-op sessions to work through these two chapters. We played the twister game which may have been the most fun we’ve had during the biology co-op. We also played a homemade vocabulary game, did the review cards and made Oreo models. We made a stop-motion video using playdough to demonstrate the stages of mitosis and meiosis and played a homemade jeopardy game. Due to some squeamish kids we used plastic models of the frog and a purchased online app for frog dissection. We also sprouted bean seeds in plastic bag taped to the window to watch process and dissected some at various stages. We used How the Body Works by Steve Parker for quite a few extra activities. It is an excellent resource. We also used the Scholastic book Body Models that Teach which is often available at their $1 sale. We also did a lot of acting out/skits/full body demos. Some I found online, some we just made up on the fly. My teaching partner has a lot of models of various body parts we could put together. In addition to doing all the microscope labs and most of the regular labs as written in the text, we seemed to heavily supplement this unit for lots of hands on activities. We also divided up chapters as there was a lot of material to cover. We played games, made a brain hat, did a series of reaction time labs, made neuron models and acted out how neurons work. We also made plastic models of the brain and labelled them. Senses – we broke these up over a few days and used a lot of the resources from How the Body Works. Activities for this section included labs on touch, making a working model of an ear, playing with a tuning fork, dissecting a cow’s eye, and doing Braille activities. We also did a series of experiments related to the connection between the sense of smell and taste. We acted out how digestion works using a small skit, did some demonstrations around how saliva works, and made models of skin. This was a fun unit. The Human Heart coloring book is a free download and it was very useful as we dissected the cow’s heart that we got from a local butcher. We did a small skit to explain how the blood travels. We also made a pop bottle model of the heart and lungs, made a model of blood, did a blood typing demonstration and looked at blood under the microscope. We did the lungs on a separate day and did a lung capacity test, tested oxygen levels before and after exercise and made the model of the lung. We played the circulation game as a wrap up. We split this chapter into two weeks. For the skeletal system we played a fun game where I wrote out the proper/Latin names of major bones on stickers and the kids had to race to label themselves correctly. Wrongly labeled parts were eligible for amputation. 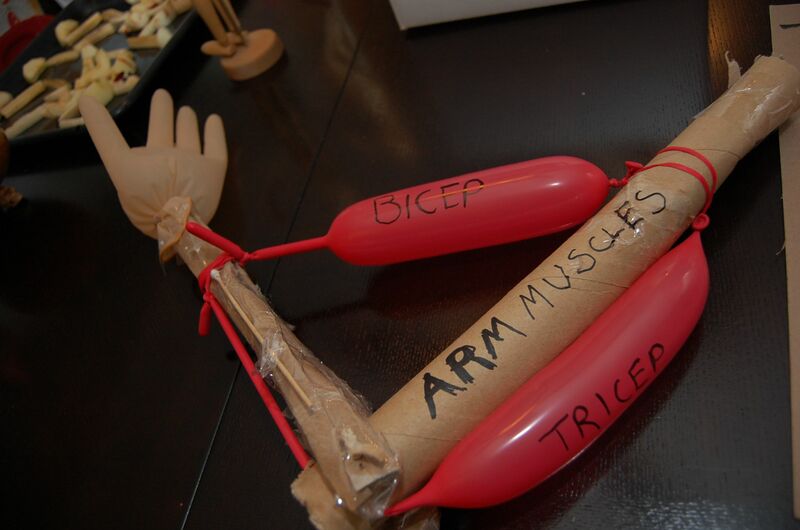 We made models of the bone, made models of muscles from the Models that Teach book, soaked chicken bones in vinegar, made a model spine using pool noodles, completed a plastic model and a puzzle of the skeletal system. We also did some strength tests and made a variety of joint models. We used a number of demonstrations from the How the Body Works book. As our wrap up the kids did this project together and we played a homemade jeopardy game using the questions in Show What You Know for the anatomy unit. Karen and Ruth’s co-op class will be finishing the rest of RSO Biology 2 in the coming school year. discovered the flexibility and beauty of leather. We planned on traveling more but our son joined the rowing team, which is a huge time commitment . I am in the process of putting some past trips on the blog. We will be taking a big trip in the summer of 2015. We are not sure where yet. When my son goes away to college I plan on traveling often. The choice to opt for homeschooling kids depends entirely on the parents. Keep in mind the following – to make the idea work, you will have to completely devote yourself in educating your child/children. I agree completely Anne. It is really a lot of work homeschooling your child(ren). I have found it an amazing journey, but it has taken over our life. I am working through a very time intensive edit of the first 19 chapters of Earth and Space, getting it ready for the illustrator, so I have not posted in a while, but I plan on addressing this very point in my next post. My next series of posts are going to be about homeschooling high school, we are in year 1. Blair — did they do any of the evolution, ecology and/or classification chapters? From where to buy R.E.A.L. Science Odyssey Biology (Level 2) & Life books in Ontario. Please help. Buy the ebooks and you will have them right away.